The Advanced Biofuels Study was commissioned by the Department of Resources, Energy and Tourism, funded through the Australian Centre for Renewable Energy (ACRE), to inform the priorities of the Australian Biofuels Research Institute (ABRI). The Study will also inform the development of the Government’s Alternative Transport Fuels Strategy. This Appendix contains a summary of detailed research and analysis from the Advanced Biofuels Study, and covers advanced biofuel (ABF) technologies, feedstock options and economics. This Appendix is intended to be read in conjunction with a Summary Report which summarises findings from the Advanced Biofuels Study, identifies priority pathways for the industry and recommends the role Government should undertake in order to facilitate the establishment of an ABF industry. Chapter two of the Appendix describes the existing biofuels landscape in Australia, including the state of the current biofuels industry and government policies. International policies are also explored, as are Australia’s comparative ABF advantages. Chapter three identifies sectors in the Australian economy that have the greatest need and ability to switch to ABF, and provides information on the fuel types that will be required. Chapter four identifies advanced biomass sources and assesses their potential as feedstock for an advanced biofuels industry of scale in Australia. Chapter five describes the technologies for transforming biomass into a refined fuel, prioritising feedstock and technology combinations into a set of most attractive ABF pathways for Australia. Chapter six presents the economics of these pathways in more detail, discussing potential cost competitiveness at commercial deployment and further in the future. In this Study, advanced biofuels are defined as liquid fuels derived from sustainable sources of organic matter that do not typically compete with food production, such as wood residues, certain oilseeds, and algae. This report summarises findings of the Advanced Biofuels Study, identifies priority pathways for the industry and recommends the role Government should undertake in order to facilitate the establishment of an advanced biofuels (ABF) industry. More detailed research and analysis of ABF technologies, feedstock options and economics is contained in an Appendix, which should be read in conjunction with this report. The report sits in the context of an industry that is still in an early stage of development, with activity to date centred on ethanol and biodiesel production. Advanced biofuels are defined as liquid fuels derived from sustainable sources of organic matter that do not typically compete with food production, such as wood residues, certain oilseeds, and algae. The Carbon Storage Taskforce developed this Plan under the National Low Emissions Coal Initiative. 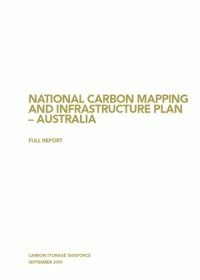 This Plan describes the risks and opportunities presented by transport and storage of carbon dioxide, acting as Australia’s roadmap to prioritising the development of suitable storage sites and the necessary pipeline infrastructure. 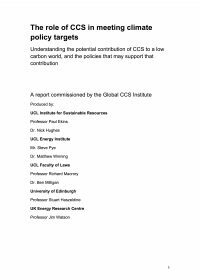 Deployment of carbon dioxide (CO2) transport and storage in Australia is technically viable and, under appropriate management regimes, safe. However, current geological and engineering activities must be accelerated and maintained over the next decade if the nation is to be in a position to capture the opportunity for commercial deployment beyond 2020.